Two or more angles in standard position (initial side lies in the positive x-axis) are coterminal if and only if they have a common terminal side. Angles such as 30°, -330° and 390° are coterminal since these three angles have common terminal side that lies in quadrant I. 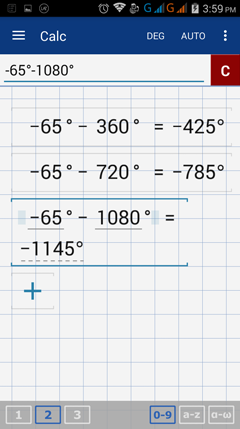 To find positive angles coterminal with a given angle, just add multiples of 360° or 2π to the given angle measure. To find negative coterminals, subtract multiples of 360° or 2π. For each angle, give the first three negative and three positive coterminal angles. 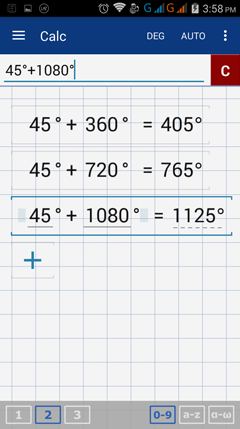 To find the first three positive coterminal angles of 45°; add 360°, 720° and 1080°. To find the first three negative coterminal angles of 45°; subtract 360°, 720° and 1080° from it. 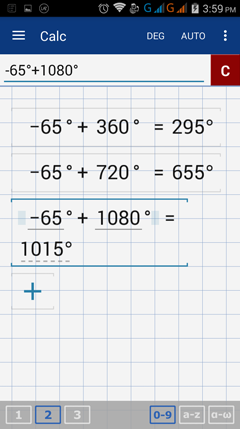 To find the first three positive coterminal angles of -65°; add 360°, 720° and 1080°. To find the first three negative coterminal angles of -65°; subtract 360°, 720° and 1080° from it. 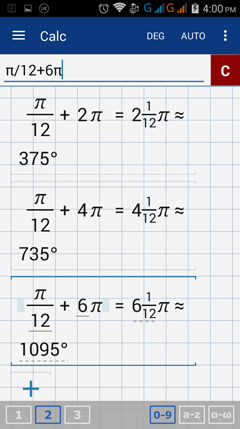 To find the first three positive coterminal angles of π/12; add 2π, 4π and 6π. 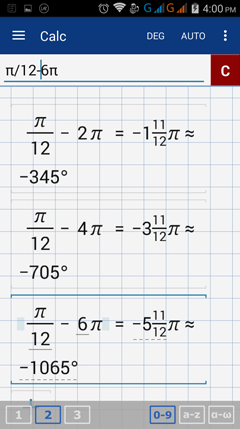 To find the first three negative coterminal angles of π/12; subtract 2π, 4π and 6π from it. 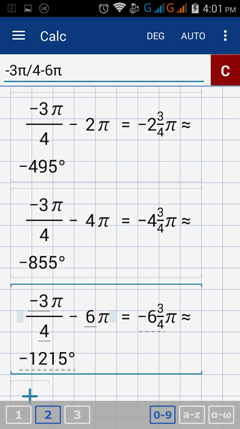 To find the first three positive coterminal angles of -3π/4; add 2π, 4π and 6π. To find the first three negative coterminal angles of -3π/4; subtract 2π, 4π and 6π from it. Since coterminal angles have a common terminal side, then these angles also have the same values for the two basic trigonometric ratios (cosine and sine). Please note that the other four trigonometric ratios are found by using either the value of sine or cosine or both. Now, consider angles 30° and -330°, which we previously claimed are coterminal angles. 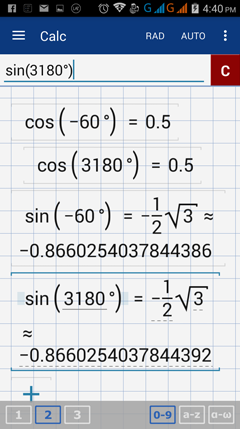 Use the app to verify if indeed these two angles have the same values for at least two trigonometric ratios (cosine and sine). 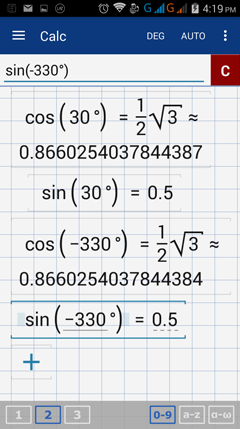 Find the cosine and sine values of 30° and -330°. Enter one ratio per line. Add the degree symbol after typing the number. Since the cosine and sine values of 30° and -330° are equal, these two angles are indeed coterminal. Verify if the given pair of angles are coterminal. Note: There are several ways on how to verify whether or not the given pair of angles are coterminal. This section uses the values of the two trigonometric ratios (cosine and sine) as proof. 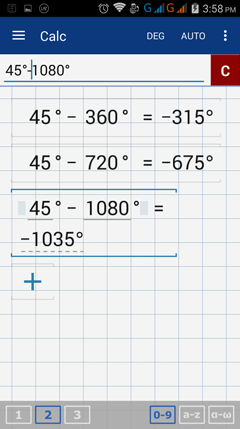 The cosine and sine values of -60° and 3180° are shown below. The cosine and sine values of -60° and 3180° are equal, thus these two angles are coterminal. The values of the six trigonometric ratios for 7π/5 are shown below. The cosine and sine values of 7π/5 and 76π/5 are NOT equal, thus these two angles are NOT coterminal.